In this scene, Detective William “the Bunk” Moreland (Wendell Pierce) is using Lake Trout as a thinly veiled allusion to Detective Jimmy McNulty’s (Dominic West) personal life. Essentially, the Bunk is warning him against trying to be something he’s not. Mcnulty swears Bunk is wrong. 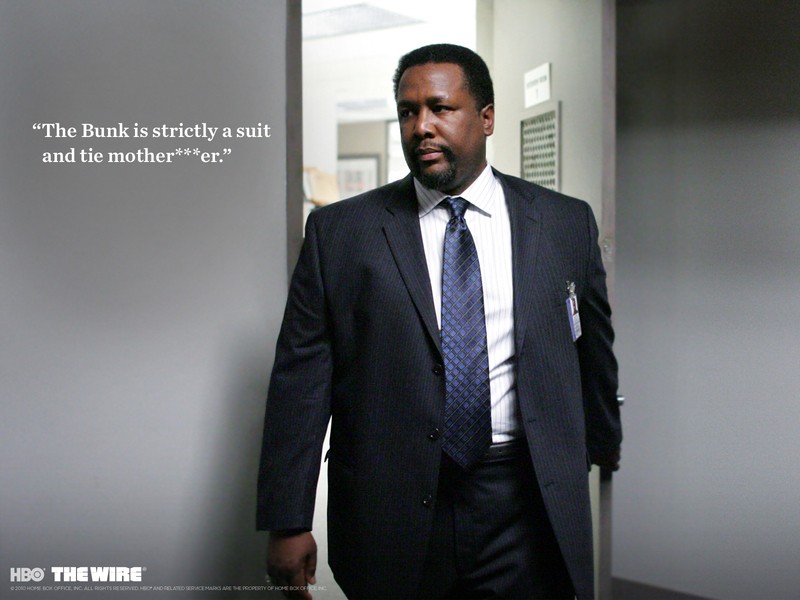 Bunk thinks McNulty is wrong. The only thing they’re both right about is that the fish fried isn’t actually Trout, and it doesn’t come from a lake. It’s actually Atlantic Whiting, a kind of bottom feeder, usually regarded as cheap and food for pets, though you can find it easily on the East Coast of the US in your grocer’s freezer. It’s strange, You don’t ever really see anyone on the show eating it (I think they do once or twice, but it wasn’t even someone from the streets eating it, it was a guy on Carcetti’s campaign… though Bodie asked for it a few times), but people order it a lot and signs for it are everywhere in the backgrounds. Living in Washington DC as I do, I drove up to Baltimore to sample a few Lake Trout meals before trying to come up with my own recipe. It wouldn’t do any reader much good to read this blog if I didn’t know what the stuff tasted like in the first place. This post will be a true to The Wire as The Wire was to Baltimore.And holy hell… I had no idea Lake Trout was such a cultural staple of Baltimore! People are very particular about this stuff: the hot sauce, the Old Bay, the drink, the fries, where to get it, how to eat it, etc. The nuances are many. I asked a few locals about how to eat it , but they all said something different. So I figured I’d go order a few and decide how I like it. A recent article in the Baltimore City Paper suggested the Roost as the spot for Lake Trout in Baltimore, but the day I went (a Sunday… I wasn’t taking any chances, I went during the Sunday truce) the line was out the door! (I think this is because Anthony Bourdain went here once) So instead, I went to Lake Trout, mentioned in the City Paper, in Edmondson Village. It was closed. Go figure. 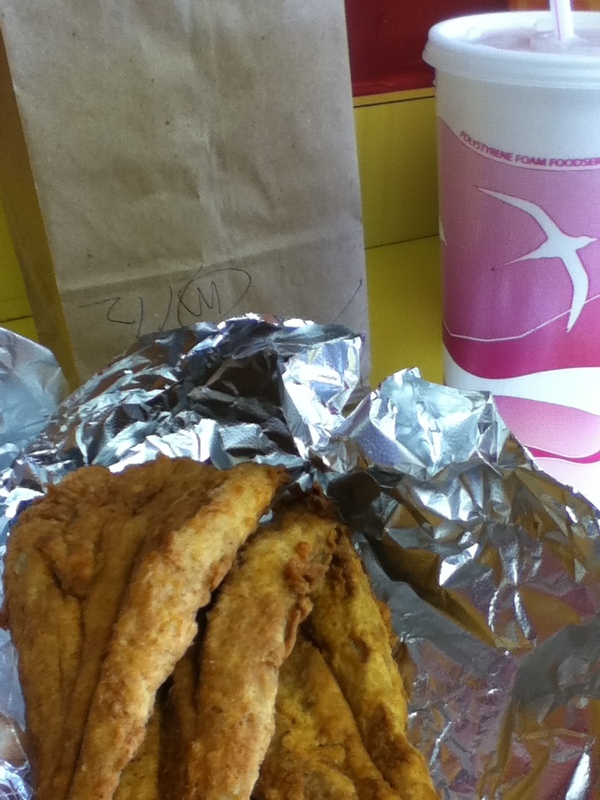 But the people outside told me to go down the street to Kimmy’s, because “Kimmy’s is better anyways.” I did. And I’m glad I did. I was disappointed at first when it didn’t come in the promised paper bag and aluminum foil combo I had come to expect. It came on white bread still, but in styrofoam and a plastic bag. But this fish was amazing. 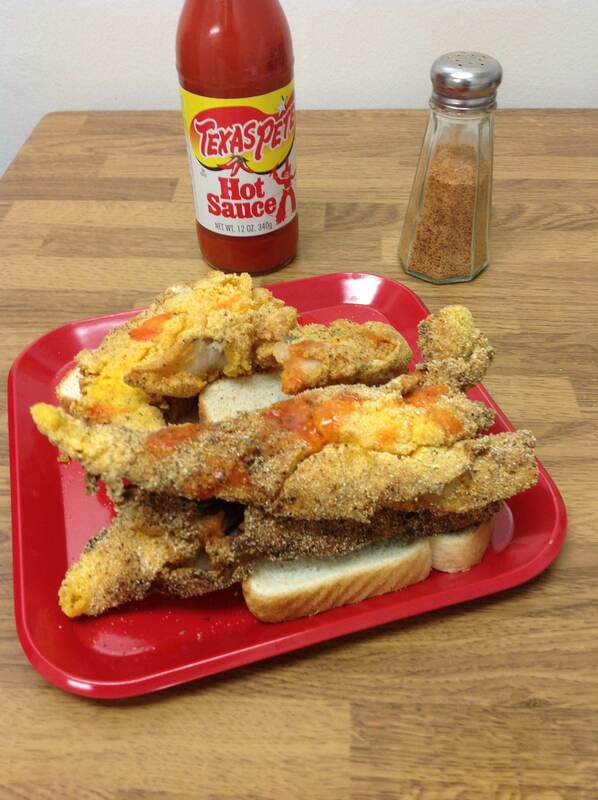 It was spicy, zesty and delicious and it came with just the right amount of the perfect hot sauce (Texas Pete. I went back in and asked). I could not get it into my mouth fast enough. What no one told me (and thankfully, nothing went awry) is that this fish is full of bones and there’s a particular way of eating it (pulling the spine out first). The regular lake trout, five fillets, and a grape soda (that’s how Bodie woulda done it) cost $7.00. Which is another reason it’s so popular. By the time I finished, Lake Trout had opened up for the day. So I ordered the regular there with a half and half (iced tea and lemonade) and I have to say, it was fairly disappointing. I think if I had gone there first instead of Kimmy’s, I might not have been so disappointed, especially because I got the brown bag and aluminum foil. But it just had half the flavor, half the zest, and the oil in the fryer could have used a good filtering. Then I thought to myself that this place is really close to a shopping area, close to the Interstate. This isn’t where Bodie or a corner crew would go. They’d be on foot anyway. So I drove deeper into Baltimore and came across the K&C Carry Out on the corner of Belvedere and Cordelia (3801 W. Belvedere Ave, if you’re interested in going). I got a Lake Trout (four fillets) and an orange soda. It was on par with Lake Trout’s. 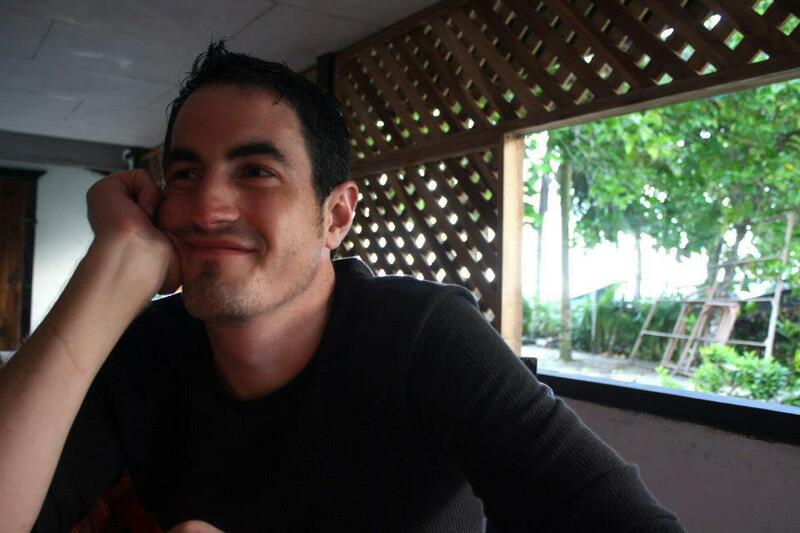 Not bad, but not something I fell in love with… not like Kimmy. Lake Trout from Lake Trout. I realize some of you are not near Baltimore. This is probably for the best. So based on my taste buds’ testimony, we’re going to come up with a recipe for wherever you might be. Start finding a bag of Atlantic Whiting and make sure its unfrozen. Deep frying anything frozen is going to be painful. Trust me on this. Papyrus: trash type for trash fish. 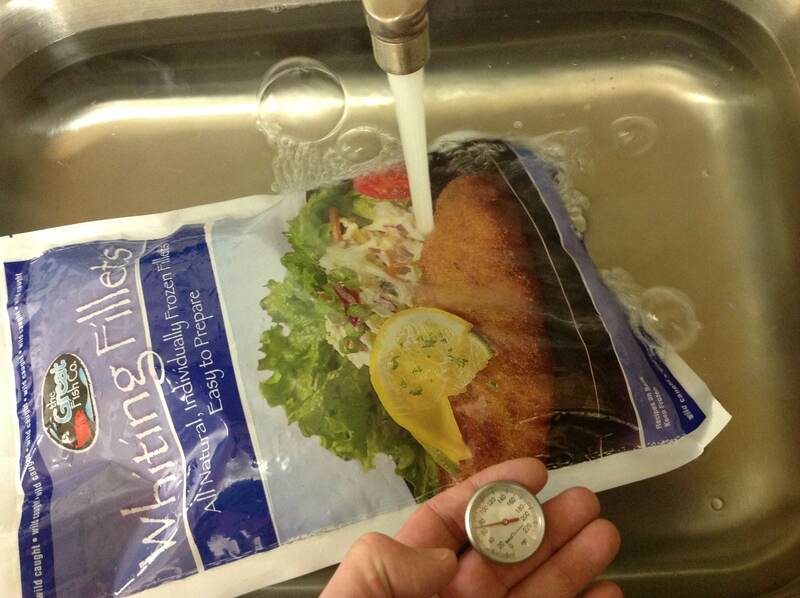 But this is how you quick thaw a bag of Whiting… don’t go higher than 70 degrees or you’ll lose the texture of the fish. No one likes mushy fish. For those of you unfamiliar with deep frying, there is usually two batters, a wet and dry, and their makeup is equally important. The first is the wet batter. 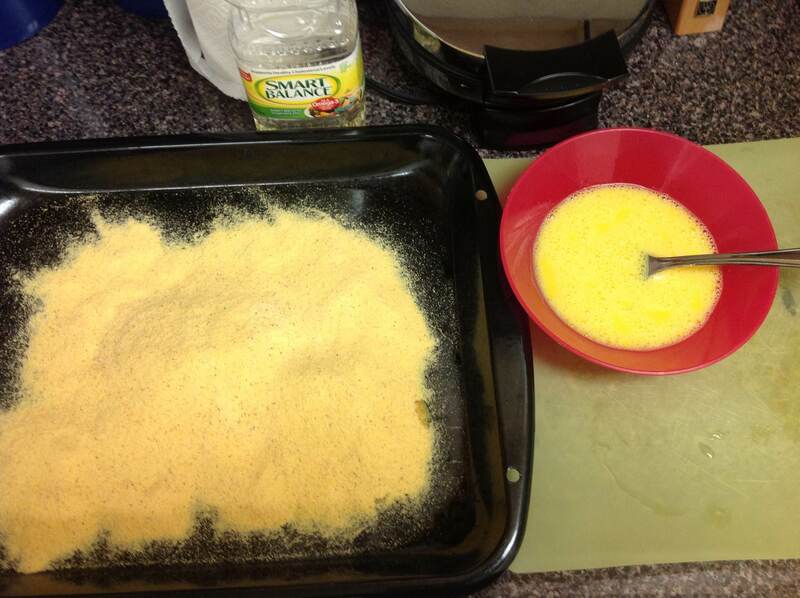 You dip the fish (or marinade it, if you have time) and then cover it in the dry batter. For this recipe, I double-dipped because Atlantic Whiting is kind of a fishy fish and I wanted to cover that flavor up a little. You can single dip if you want, but when you dress to impress, you wear your finest coat. Just sayin’. Again, you can either dip the fish or marinate it for a period of time. A Southern twist on this recipe would call for using peanut oil, but in every Baltimore carry out I went to, the smell of vegetable oil was unmistakable. If you’re cooking in a deep fryer, preheat your oil to 375. If the oil starts to smoke, your temperature is too high. Anything below that will let the fish absorb the oil and it’ll just turn greasy and kinda gross. If you’re cooking in a pan at home, make sure you give the fish plenty of room to get into the oil. It’s going to need to be submerged. At this point, I want to remind everyone that a grease fire is a dangerous situation. If one should occur while you’re making Baltimore Lake Trout, be sure not to throw water on it and to only use a fire extinguisher if the fire is catching to your walls. Just turn the burner off and put the lid on the pan. Just smothering the fire will put it out. Technically, you want to cook the fish to 140 degrees (F), but four to five minutes in hot oil should do the trick. Mind the color of your oil! If the oil becomes dark brown sludge, your fish is going to fry that color. You cannot tell how done fried food is by the color and this is why. If you want a golden brown fish on your Wonder Bread, make sure your oil stays relatively fresh. You also can’t tell when fried fish is done by smell. The only surefire way to tell is by taking its temperature… but you’ll get a sixth sense for it after frying for a while. 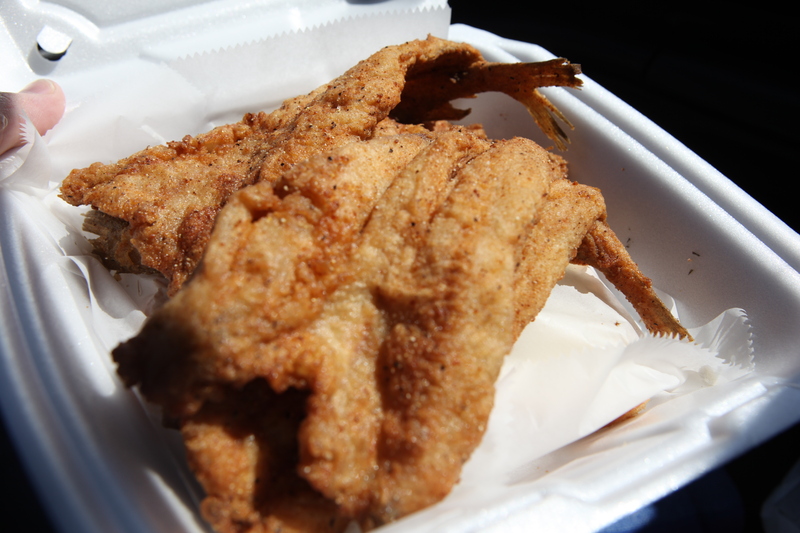 I’ve been doing it for years now and I can do a fried whitefish mind meld. When you pull it out, don’t put the fish directly on a plate. Put them on a plate of paper towels first to soak up the excess oil. Then serve them. Serve on white bread with a hot sauce option and Old Bay Seasoning. If your house doesn’t have a shaker of Old Bay, looks like the time is right for you to get one, motherf****r.
Lake Trout from Blake’s DC Carry Out. Bodie would order his with grape or orange soda. Of course… Bodie dead. I was interested in the preparation. Been frying fish for a living my entire adult life and, being from Ohio, had a completely different idea of what “Lake Trout” might be. Sounds like a good recipe. I’ll have to clean the fryer and pick up some whiting.